Many years ago in Cuzco, high in the Andes Mountains of Peru, Elder A. Theodore Tuttle and I held a sacrament meeting in a long, narrow room with a door that opened onto the street. It was night and it was very cold. While Elder Tuttle spoke, a little boy, perhaps six years old, appeared in the doorway. He was naked except for a ragged shirt that went about to his knees. On our left was a small table with a plate of bread for the sacrament. This ragged street orphan saw the bread and inched slowly along the wall toward it. He was almost to the table when a woman on the aisle saw him. With a stern toss of her head, she banished him out into the night. I groaned within myself. Later the boy returned. He crept along the wall, glancing from the bread to me. He was near the point where the woman would see him again. I held out my arms, and he came running to me. I held him on my lap. Then, as something symbolic, I set him in Elder Tuttle’s chair. After the closing prayer, much to my sorrow, he darted out into the night. I have never forgotten that little street orphan. Many times in South America I have looked for him in the faces of the people. When he comes back into my mind, others come with him. After World War II on a cold night in a train station in southern Japan, I heard a tap on the train window. There stood a boy wearing the same ragged shirt, a rag tied about a swollen jaw, his head covered with scabies. He held a rusty tin can and a spoon, the symbol of an orphan beggar. As I struggled to open the door to give him money, the train pulled out. I will never forget that hungry little boy standing in the cold, holding up his empty tin can. There was a sick little first grader in a hospital at a government Indian school with a fever and running nose. I opened a package from his mother, hundreds of miles away on the reservation. Wrapped in a cardboard box with an auto parts label, which no doubt she got from the trading post, were some Navajo fry bread and pieces of mutton﻿—a Christmas present for her little boy. Children are the past, the present, and the future all blended into one. They are consummately precious. Every time a child is born, the world is renewed in innocence. I constantly think about and pray for the children and youth and their parents. Recently, I attended a sacrament meeting given by children with special needs. Each was disabled in hearing or sight or mental development. Beside each was a teenager assigned as a companion. They sang and played music for us. Facing us on the front row was a young girl who stood and signed to those behind us who could not hear. Jenny gave a brief testimony. Then her parents each spoke. They told of the utter agony they had known when they learned that their child would never have a normal life. They told of the endless, everyday trials that followed. When others would stare or laugh, Jenny’s brothers put an arm protectively around her. The mother then told us of the love and absolute joy Jenny brought to the family. Those parents have learned that “after much tribulation, … cometh the blessing” (D&C 103:12). I saw them bound together by adversity and refined into pure gold﻿—true Latter-day Saints. In the days of the prophet Mormon, some who did not understand that little children are “blameless before God” (Mosiah 3:21) and are “alive in Christ” (Moro. 8:12) wanted to baptize little children. Mormon said they “[denied] the mercies of Christ, and [set] at naught the atonement of him and the power of his redemption” (Moro. 8:20). “Behold, I speak with boldness, having authority from God” (Moro. 8:14, 16). Only when a child reaches that age of accountability, set by the Lord at eight years of age (see D&C 68:27), is their baptism essential. Before that age, they are innocent. Children should not be ignored or neglected. They absolutely must not be abused or molested. Children must not be abandoned or estranged by divorce. Parents are responsible to provide for their children. The Lord said, “All children have claim upon their parents for their maintenance until they are of age” (D&C 83:4). We are to look after their physical, their spiritual, and their emotional needs. The Book of Mormon teaches, “Ye will not suffer your children that they go hungry, or naked; neither will ye suffer that they transgress the laws of God, and fight and quarrel one with another, and serve the devil, who is the master of sin, or who is the evil spirit which hath been spoken of by our fathers, he being an enemy to all righteousness” (Mosiah 4:14). Nothing compares with a father who is responsible and in turn teaches his children responsibility. Nothing compares with a mother who is present with them to comfort them and give them assurance. Love, protection, and tenderness are all of consummate worth. The Lord said, “I have commanded you to bring up your children in light and truth” (D&C 93:40). All too often, a parent is left alone to raise children. The Lord has a way of strengthening that parent to meet alone what should be the responsibility of two parents. For either parent to deliberately abandon their children is a very grievous mistake. I think often of another boy. We met him at a seminary graduation in a remote city in Argentina. He was well clothed and well nourished. The students came down the aisle up to the stand. There were three rather high steps. He could not make the first step because his legs were too short. He was a dwarf. It was then we noticed marching behind him two stalwart young men who stepped forward, one on either side, and lifted him gracefully to the podium. When the service was over, they lifted him down again and then marched out with him. They were his friends and watched over him. This boy could not reach the first step without being lifted up by his friends. Those who come into the Church come as children spiritually. They need someone﻿—some friend﻿—to lift them up. “… Strong meat belongeth to them that are of full age, even those who by reason of use have their senses exercised to discern both good and evil” (Heb. 5:12, 14). The Apostle Paul wrote, “I have fed you with milk, and not with meat: for hitherto ye were not able to bear it, neither yet now are ye able” (1 Cor. 3:2). In a revelation given in 1830, just before the Church was organized, the Lord cautioned, “They cannot bear meat now, but milk they must receive; wherefore, they must not know these things, lest they perish” (D&C 19:22). We must be careful lest we make that first step too high or design it for those with strong, long legs and leave the others without some friend to lift them up. When some disciples rebuked those who brought little children, “Jesus said, Suffer little children, [suffer means to permit] and forbid them not, to come unto me: for of such is the kingdom of heaven” (Matt. 19:14). When His disciples asked what kind of men they ought to be, Jesus set a little child in their midst (see Matt. 18:2–3). Except we “become as a little child, [we] can in nowise inherit the kingdom of God” (3 Ne. 11:38). A deep concern for children and their parents is in my mind and heart and soul. 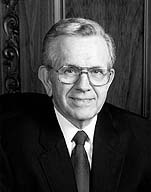 Now in my 78th year, I understand what President Kimball was seeing; I know what he meant. That boy in Cuzco and the one in Japan and the other children about the world profoundly influence what I think and how I feel and what I pray for most earnestly. I constantly think of little children and their parents who struggle to raise them in ever more perilous times. Like my Brethren, I have traveled all over the world. Like my Brethren, I have held positions of trust in education, in business, in government, and in the Church. I have written books, and, like them, have received honors, degrees, certificates, plaques. Such honors come with the territory and are undeserved. Assessing the value of those things, the one thing I treasure more than any of them﻿—more than all of them put together﻿—the thing of most value to me is how our sons and daughters and their husbands and wives treat their children and how, in turn, our grandchildren treat their little ones. This blessing has come to me as a gift from my wife. The Lord said of such women, “[A wife is given to a man] to multiply and replenish the earth, according to my commandment, and to fulfil the promise which was given by my Father before the foundation of the world, and for their exaltation in the eternal worlds, that they may bear the souls of men; for herein is the work of my Father continued, that he may be glorified” (D&C 132:63). With women such as this to be the mothers of children, we see why the Lord revealed “that great things may be required at the hand of their fathers” (D&C 29:48). I bear witness that the gospel is true, and the power of it is to bless little children. I pray earnestly that the children and youth and their parents will receive the gift of the Holy Ghost, that it will be a guide and a protection to them, that it will bear in their hearts the testimony that Jesus is the Christ, the Son of God, the Only Begotten of the Father. In the name of Jesus Christ, amen.